They all have different personalities, but really, most dogs have the same bad habits!! I wanted to show this photo especially to Kristina at Pioneer Woman at Heart, just for solidarity lol, she wrote a post the other day about her dog Zuri who was chewing things up. About a year and a half ago, this couch actually was in good condition! 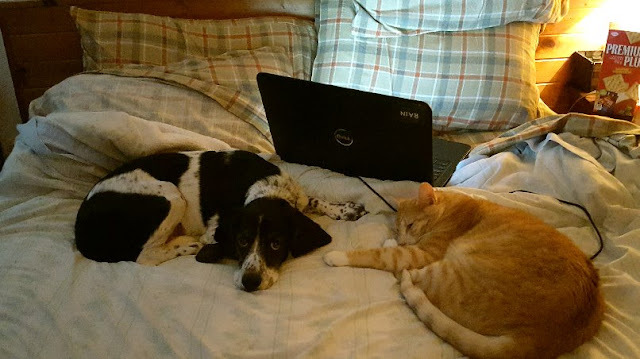 Ever since we got the three rescue dogs in the fall of 2015...well, as you can see. And this is the good side, I turned the pillows over for the photo! We are reduced to putting bed sheets on everything now because we are a pet-house, i.e., they are allowed to be up on the couches and the beds because we just adore their company! Every time we're at a bazaar or rummage sale, we pick up all sorts of sheets and pillow cases to hide or protect our furniture! I feel like I'm one step away from putting those plastic covers on the furniture. When we buy our home in a few years, we'll likely keep one room as our bar/lounge where it will be a doggy/kitty-free zone so we can have a few nice fur-free pieces of furniture! Then again, it's hard to close a door on those sweet faces so we'll see! More holes...imagine my surprise. 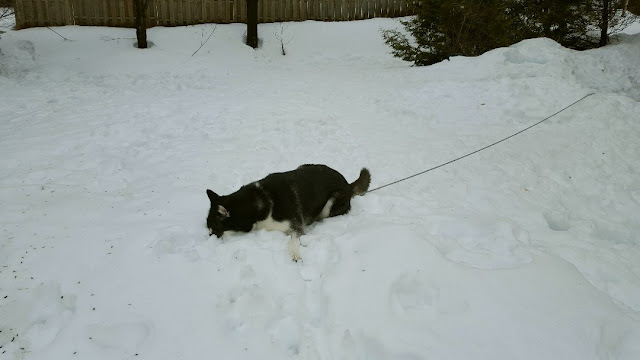 I'm out in the yard with the three dogs when suddenly my foot gives through 3 feet of snow! I actually got stuck for a few moments until I got my bearings. Did any of the dogs come to my rescue? Nah...they thought I was playing! I decided on the tuck and roll method to get myself out lol...it was quite the scene. I was up to my hips. 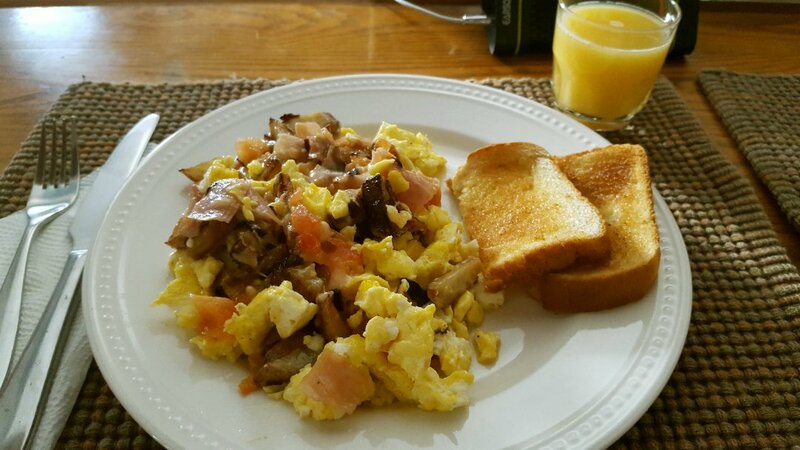 I'm still on the mend from that bout of food poisoning, but you can't keep me out of the kitchen. My boyfriend has been fending for himself since Monday but last night I wanted to make him a nice healthy dinner. 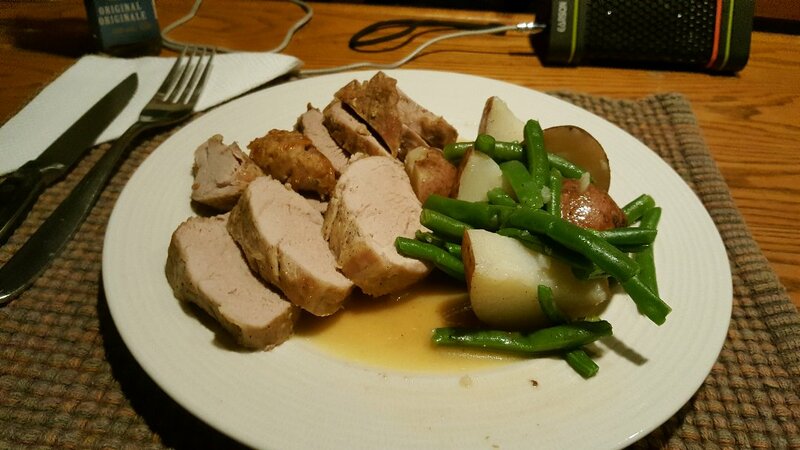 I made a pork tenderloin with some boiled potatoes and green beans. I haven't bought a bean since August! He loves them so I bought a bunch when they were a good price at the market and portioned them out in the deep freezer. I still have enough for 8 more dinners. I follow this recipe for the tenderloin, it's the easiest recipe to make and turns out delicious each time, though I cook it a total of about 35 minutes in the oven: Simple Roasted Pork Tenderloin. The rest of the pork will go into a stir fry in a few days. I used to LOVE drinking tea. But lately I suffer the worst heartburn when I have a cuppa. I was reading about how the tea bags for most of the teas out there are bleached with chlorine and can cause stomach upset when you drink the steeped tea. I'm trying so hard to get rid of all processed foods, our digestion is very fragile. So I thought I'd give it a test and buy some loose tea to see. Was I prepared to pay $7 for this tiny little tin? NO. If I can drink this without the heartburn, I will have to find a less costly source! Nice tin though...and a breath of fresh air. NO FRENCH on the tin. I live in Quebec and the law states that French must be the dominant language on all marketing and advertising. Twinings got away with it by putting a very easily removable sticker on one side with French writing. I just pulled it off and there we go. I won't get into the politics here but basically English people are not welcome in this province. Our hope is when we buy a property, it will be in another province. - Melt the butter in a large pan over medium heat and add the potatoes. After about 5 minutes, add the onions. At this point, I turn down the heat to medium low, cover the pan and stir now and then until the potatoes are really soft, about 20-30 minutes depending on the size of your dice. 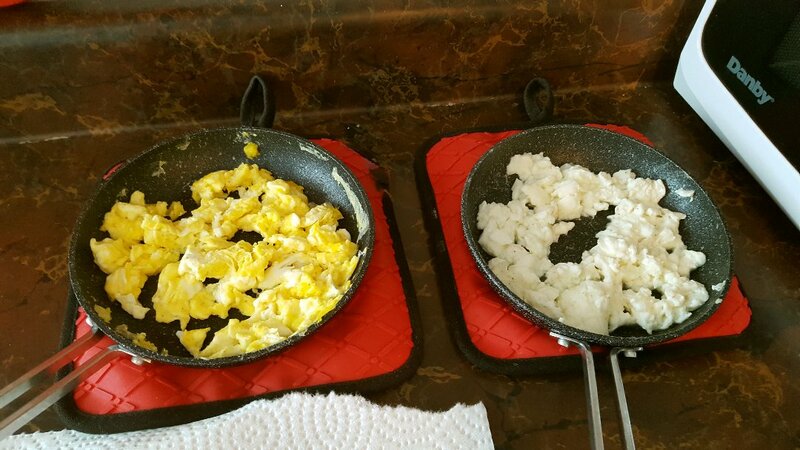 - When the potatoes are nearly done, you can push them to one side of the pan and add the eggs to the other to scramble them. This is what I do. I LOVE these little pans! I scramble them separately then add them at the end. - Add the ham and the tomatoes and let them cook together a few minutes. 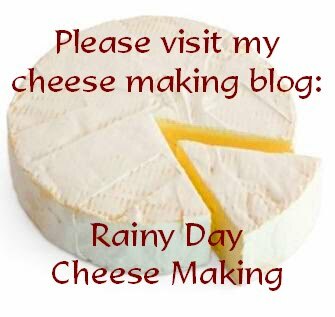 - Sprinkle with cheese and mix it all up until it's melty and gooey! Yum! - Get your boyfriend/hubby to do the dishes. Just cooking this morning took a lot out of me. I am better digestive-wise, but the bout of food poisoning really left me weak without much energy. So now I'm in bed with Jack and our cat who thinks he's a dog, Oscar. He's another rescue from the fall of 2015. We can't walk into the shelter anymore! We already had 2 cats and within 3 months time in 2015, we added another cat and three dogs. We definitely have a full house! Haha...I had to giggle at your couch. We decided to buy a new coych two years ago and my ... do i ever regret that. Its a huge stress factor and I am surprised that with, at times, 6 kids, 4 cats...as of today ... 5 cats, two dogs and a goat in the house, all the couch has suffered so far is a few little stains...lol but I always stress about it. NO fun. I remember when we got the couch ... it was maybe two days old. Lily was 2 and we had another 2 year old girl living with us. Those two managed to sneak the diaper cream out of the bathroom ... all it took was 5 minutes and I found them sitting on the couch, their faces covered in diaper cream. Nothing had touched the couch yet ... i nearly fainted immagening what could have happened...now i just think it is funny. the good thing about chow chows is they won't even lay on a couch, and they chew nothing! that pic of your pup and kitty is precious. i'm dying here....it's 80 degrees...in february????? wtf???? 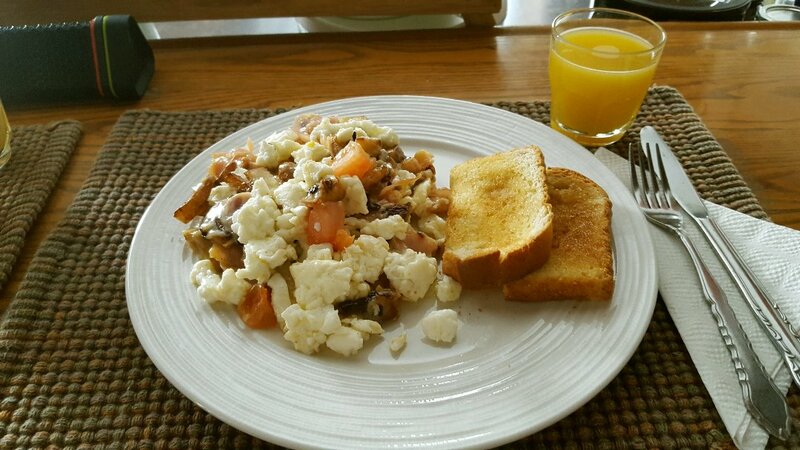 Mmmm, your food always looks so good! 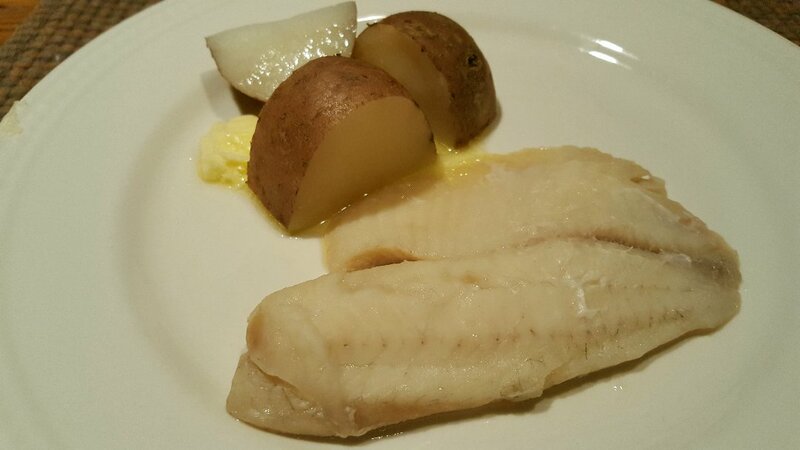 Even your plate of just fish and taters (and butter). Had I the choice though, I would have loved your bf's plate. I've always liked pork! After the bout you had with food poisoning (or whatever the heck it was), it's no wonder you're feeling weak. It will take a few days of feeling normal before you get your zip back. Do take care! Good grief, that's a lot of snow. Good thing you weren't hurt! And I have to say that having pets isn't all that different from having kids in some respects - it's a losing battle trying to keep the house looking like a magazine cover, LOL Sorry to hear about the food poisoning. :( That's not a fun one at all. Ah that couch looks a bit familiar. We too had a critter issue but when we moved we handled things a bit differently. The rescue crew (16 years with Great Pyrenees Rescue) was always outside in large kennels. However we always had a large number of dogs and cats. We just made some gentle changes with the move and they worked for us and the critter contingent. Love the brunch and your enthusiasm for every day and what it brings. I would never have handled food poisoning with such grace and flair! Hi Nik, you're lucky with that couch! I'ts mostly Charlie's nails...they aren't sharp but my gosh they are hard as nails. She digs them into the couch when she's playing tug of war with the other two. But you know, it's just a material object in the end, having cuddles from the dogs is so much more meaningful to me! I think though...it'll be second hand purchases from now on lol... :) And thanks I do feel much better each day! Hi Joyce :) I never knew that about chow chows!!! Wow...do they shed??? I guess that would be expecting too much lol! 80? Geez...26C, that's like July weather, there is some kind of weird happenings in the air. Though I'm enjoying not shoveling snow right now. :) My bf and I decided this year to keep our snow clearing money for the upcoming boat purchase and right now I can say it was a good decision. Hi Mama Pea! I'm a fan of pork too, the tenderloin is so yummy! Thank you for the well wishes! I'm lucky that I'm being spoiled and taken care of these days. Yeah, the fish..well, it was the best fish I've ever had lol..you know after not eating for 4 days! Hi Leigh :) Oh gosh, I've given up trying to Martha Stewart my home ha ha...We had so much snow in January and it's raining a lot now and quite mild, I don't know where to walk in the back yard. 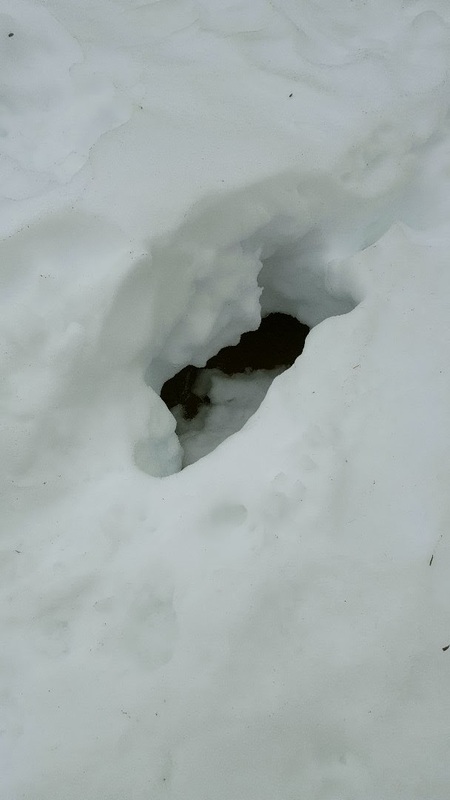 This morning I had my snowshoes on so I wouldn't sink again. I hope all of your little kiddies are doing well! Thanks to everyone for their well wishes. The most important thing is health as we grow older! Oh how I had to laugh. 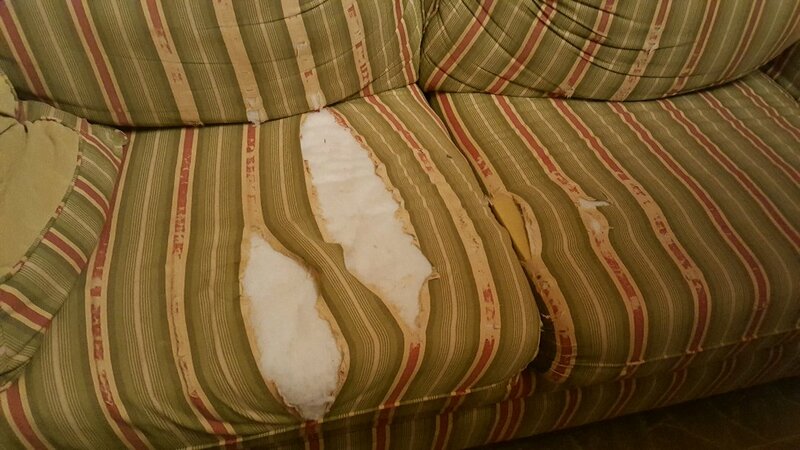 Zuri chewed up the sofa too. I had to buy blankets to cover the cushions. She chewed up the hard cover off of one of the kids books the other day too. Oye. The food looks great! I hope you feel better soon. For tea, I buy "make your own" bags from mountain rose herbs, and bulk tea. They are bleach free. I also have a tea infuser cup. It has a removable filter in the bottom, so I just toss in the tea leaves, pour in boiling water, close the lid and brew. Then it sits on the top of a mug, drains the tea, and keeps the leaves inside. Just empty and reuse it. Hi Kristina :) Sorry I missed your comment, for some reason, I never get your comment notifications. 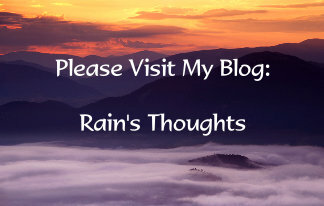 Blogger is wacky. I knew you'd relate to the sofa ha ha...way back in 1996 when I first got my own dogs, I had 2 pugs, both puppies. I came home from work to find a thousand dollars worth of sewing patterns all torn and chewed up, I was SO DEVASTATED!!! But who can blame a teething set of pugs whose owner had no clue they'd do it??? I'm still rebuilding my sewing pattern collection! I have one of those little oval shaped tea filters that I've been using and it leaks the tea leaves slightly but it works! So far, I'm digesting it okay! 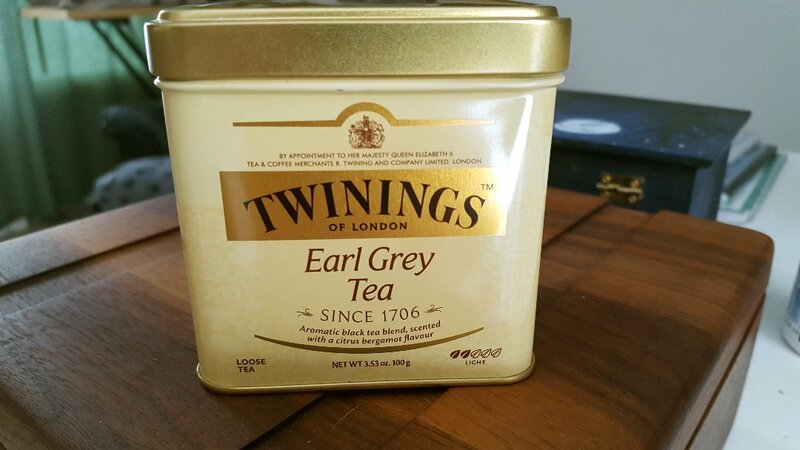 I love Earl Gray!